A sea voyage on wheels! In 1892 with the Electric Railway comfortably installed as far as Paston Place Magnus cast his eyes towards Rottingdean. To extend the existing railway the three miles would entail either a steep climb to take it along the cliff top or a man-made viaduct along the unstable undercliff. Understandably he was not keen on either alternative so he turned his mind to building a completely new railway that would ‘travel through the sea’. A similar system was already in operation across St. Malo harbour in Brittany but this was pulled along the rails by chain rather than being self-propelled, and ran through sheltered water not the English Channel. Finance for the new railway was found locally. One of the biggest investors was Edward Bleackley who became the first Chairman of the new company. R. StGeorge Moore, later to be engaged as the designer and engineer of the new Palace Pier, was taken on as the project engineer, and under his guidance a Bill was submitted to Parliament applying for an Act to incorporate a Company and then empower that Company to construct an electric railway on the foreshore between Paston Place and Rottingdean, together with the associated works and piers that would be needed. Construction of the line started in June 1894 and as can be seen from this contemporary engraving the trackbed consisted of two separate 2ft 8½” gauge tracks with their respective outer rails 18ft apart. To provide maximum stability the car ran on both sets of tracks leading to claims that it was an 18ft gauge vehicle! To support the track 5ft x 3ft concrete blocks were morticed into the chalk bedrock every 2ft 6″. 52lb per yard flat bottom rails in 30ft lengths were then secured to the block using 6″ x ¾” clip bolts. 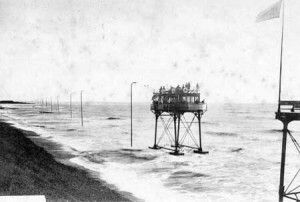 To provide power to the car a series of trolley standards were set on the land side of the track supporting the trolley wire 21ft above the spring tide level. 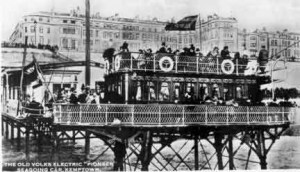 While the track was being laid, the Gloucester Railway Carriage & Wagon Company were getting on with the salt water tram – suitably named ‘Pioneer’. Weighing in at about 45 tons it consisted of an elliptical deck 45ft long by 22ft wide supported on four braced tubular legs each 23ft long. At the bottom of each leg was a bogie housing four 33″ wheels. One bogie on each side was driven by a shaft and worm gear arrangement from 2 General Electric 25hp electric motors. The other 2 legs carried the brake rodding to the other two bogies. An ornate saloon 25ft 3″ x 12ft 6″ was mounted centrally on the deck and a promenade deck, accessed by a stairway at end of the saloon, was fitted on top. 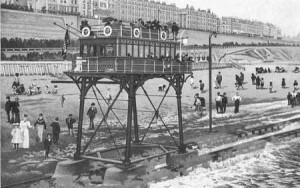 Control of the motors was provided by using tramway type controllers mounted at the ‘pointed ends’ of the deck. Permission to run was finally granted on November 27th and the railway opened with due ceremony on November 28th 1896. The Mayor and Mayoress of Brighton were joined by representatives from Rottingdean and Hove as well as Brighton’s two MPs. for a return ride on the railway and a celebratory lunch. Unfortunately, due to family problems Anna was not able to be with Magnus in his moment of triumph, which by all accounts went extremely well. In the light of day things did not seem as bad as they had looked at the height of the storm. 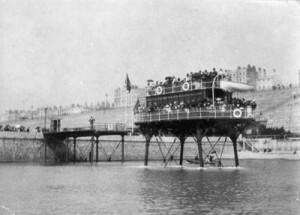 The track was only broken in one place, the overhead wire was still intact with only three poles damaged, and the jetty had survived at Paston Place even if the building had gone. But however popular the railway might be it had serious defects which were exacerbated by a lack of money. Pioneer was underpowered for anything other than shallow water – the resistance at high tide slowed it to an elderly walking pace. New, more powerful motors would have cured this but money was tight. The company never recovered from the cost of the reconstruction works so a proposed second car was never going to materialise. With a new century upon him Magnus found that the two new concrete groynes constructed by the Corporation a little east of the Banjo Groyne had caused considerable scouring of the seabed and subsequent damage to the trackbed. 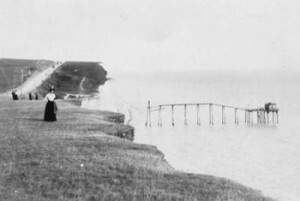 This caused Magnus to close the line for several weeks during July and August 1900 – causing a terrible loss of business during the height of the summer. As if this was not enough there was worse news to come. In September 1900 Magnus was informed that he would have to divert his line around the end of new sea defence works being planned between Paston Place and Black Rock. This would involve moving into much deeper water and even further investment. In January 1901 following a reminder of their powers under the Act of 1893 the Corporation removed those parts of the track which were in their way. Operations stopped immediately, the Board looked to the future and saw none. 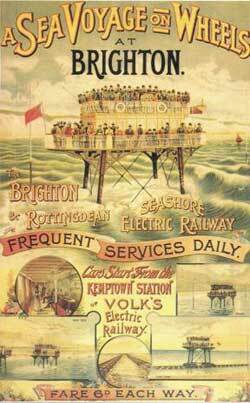 On the 23rd June 1902 an Act was obtained allowing the abandonment of the sea-going line and the construction of a conventional electric railway between the newly opened station of the Electric Railway at Black Rock and Rottingdean along a 2 mile man-made viaduct. Unfortunately the capital requirements of such an extension were way beyond the Company’s means and efforts to raise the money before the statutory 5 years elapsed came to nothing. No longer required Pioneer was lashed to the pier at Ovingdean to await its fate. There was no rush to remove it and the car remained in situ gently rusting away until 1910 when the remnants of the railway were sold for scrap. Rails, poles, piers and Pioneer were dismantled and scrapped, much of it going to Germany where it was no doubt used in munitions and fired back at our troops four years later. Today very little remains to remind us of this most valiant attempt. Concrete is a great survivor and some of the sleepers remain at Rottingdean to prove it was not all a dream! To find out more about what remains today of this valiant railway you couldn’t do better than purchase a copy of Ricky Shaws ‘In search of Daddy Longlegs’. Shot during 2004 this 25 minute DVD traces the path of the old railway and along the way discovers some of the sleepers still in place, along with other reminders of this unique railway.